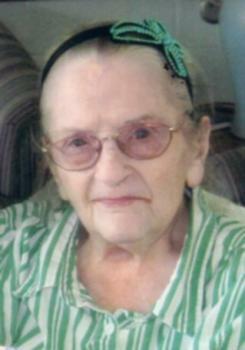 I. Jean Griffith 93, formerly of Richwood, passed away Saturday December 6, 2014 at the Marion General Hospital. She was born September 24, 1921 in Ostrander to the late Fred O. and Lottie Ruth (Edwards) Sabins, she was also predeceased by three husbands: Albert Lucas, Manford Geho and Ray Griffith, four brothers: Wray, Carl, Fred and Jeff Sabins and one sister: Ruth Thompson. Jean was a member of the Calvary Baptist Church in Marysville; she had worked as a machine operator at Delo Screw retiring in 1979 after almost 19 yrs of service. At the Marion Manor where she has been residing for the last 10 years, she enjoyed playing Bingo and doing word search puzzles. Surviving is her daughter: Judy (Verne) Payne of Richwood, three sons: William (Sandra) Lucas of Topsham, ME; Michael (Sharon) Lucas of Columbus and Earl Geho of Tavares, Fl. Funeral Services will be held Thursday December 11, 2014 at 1:00 pm at the Stofcheck-Ballinger Funeral Home in Richwood, where friends may call one hour prior to the service. Pastor Jerry McQueen will officiate; burial will follow in the Oakdale Cemetery. Especially during this holiday season. I will always be her eldest niece. Jean was a delight! We would visit her and she was always upbeat. She was so cute wearing her variety of headbands. It was a pleasure knowing her. Sending our sympathies. I want you to no I have you in my heart and was very sorry to here of your mother passing. I have to work today so can not be there in person but you are in my thought and prayers.